Do You Have a Conformation Question? What is a herring gut? A horse is said to have a herring gut when its barrel narrows rather quickly in conjunction with its coupling. Letter “b” in the following picture is referring to a herring gut. I see a lot of potential in this OTTB. The overall bone and structure of this mare is quite nice. She has a nice amount of balance, with a well sloped shoulder and correct length and build to her hip. She has a bright eye, alert ears, and well refined muzzle as well as a chiseled face. Also, she is extremely correct in her front underpinnings although I suspect she may be a little post legged in her hind legs and I believe she may also have a slight herring gut. 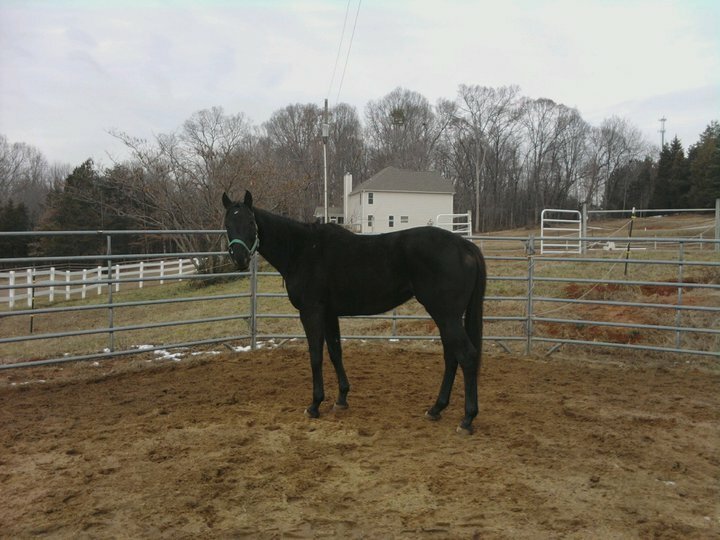 She has very nice length and proportion to her neck and a little bit of height in her withers is to be expected. All in all, I’d say this is a lovely mare with a great future ahead of her. What does it mean when a horse “looks over at the knee”? If you were to drop a straight line, perpendicular to the ground, down a horses side to the middle of his hoof, an ideal leg would have the horses knee very slightly behind/on the line. However, the knee of a horse that was “over at the knee” would fall in front of the line. Also, let it be known that being over at the knee is less of a fault than being what we call “under at the knee”.